The key to scaling your business is working on your business and not in your business. I realised it was needed when I was working 14-hour shifts seven days a week and still not getting through the work. Do not let delegating tasks get mixed up with being lazy because an effective owner manages staff and does not carry out the technical work. So I started to look at tasks which were repetitive and process these so staff could complete. It was confusing and worried me a little bit, relinquishing control over something, isn’t a task I had done before so the idea of it was daunting. But when you first release some work through delegating you get a huge weight lifted off your shoulders. I decided to pull in several big influencers, who have scaled big companies with a lot of staff, for their opinions on delegation. The truth is it’s not a nice feeling relinquishing control because everyone gets worried they can run off and steal all your business. But many can’t because what makes your business busy is you, your networking, the countless years building your referrals from fellow marketers. 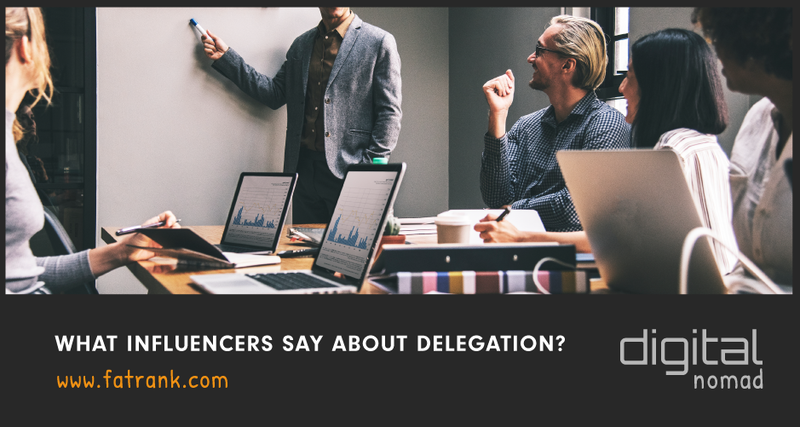 So let’s hear what the influencers have to say on delegation below. Kurt is one of the best (if not the best) examples of delegation and building businesses at a scale that can cope with 10x, like franchises. He is an aged warrior who has done everything from client, affiliate to investing heavily into online companies. Here is what he says when I asked him the question regards to delegation? We have this tendency as business owners & CEOs to think we do a good job at everything. From my experience the opposite is true. If you are a business owner you are probably good at vision and directing the company. You should lead your company in the direction it needs to head. To do that YOU CANNOT get involved IN the business. You MUST hire specialists to perform the tasks so you can SCALE the business. What happens if you take 2 weeks off? Will the business run without you? It should!! What if you get sick or go through a bad emotional period? Will the business be impacted? It shouldn’t!! Would you be able to work with 2x the clients right now? What about 5x? By removing yourself from the day to day, it allows your business to thrive as it should. It allows you to focus on the vision. We are in an amazing age where we have millions of highly skilled, university educated and self-taught specialists at our fingertips. Due to their location around the world, you can sometimes hire them for less than a person gets paid at McDonald’s. It is a truly unique time for business, take advantage of it. Whatever Kurt says with regards to delegating work needs to be listened to. His points above on would your business still function if you 5x the number of clients, and it being a unique time in life to make the most of the digital era is so true. You have to be systems dependent and not people dependent so you can scale like franchises to huge growth areas. For anyone who does not know Matt then he is very well known in the SEO industry, for his knowledge surrounding backlinks. He has utilised what is still to this present day the most important Google ranking factor and grown multiple online businesses. “At the beginning of my entrepreneurial journey, I definitely feel like it took me much longer to let go of tasks than the average person. Maybe it’s because I’m a natural introvert and find it comfortable to work alone. Maybe its because I came from a dismal corporate experience and I associate bloated business with traumatic torture. So for a long time, not only would I be writing my own content about subjects I knew nothing about. But I’d write content for my own PBNs as well. Yes… I’d write content for websites that no one would ever read. But that was my breaking point. The first thing I ever outsourced was content. In my naivety at the time, it wasn’t really that I felt like delegation was some super-wise business move. It was more about the fact that writing content started to break me. It was just too much writing 10 articles per day. But after I took that first step, delegation became much easier. I let go of IT tasks, sales tasks, etc. But when it was time to get rid of SEO tasks like keyword research, onsite optimization, link building… I got stuck again. Now it was my ego getting into the way. I would tell myself that these skills are what makes me successful in business. How can I possibly find someone who can do equally as good as me? The paradigm shift occurred when I realized that I wasn’t born with these skills myself, eventually, I learned them, and I’m no genius. If I can do it, so can someone else. With a little faith and the blessing of finding my (now) great friend and business partner Jay, I trained him up and our business started to flourish. We trained together, developed an SOP, and that’s now being used to help mould other talented SEO professionals. There are a couple of points to take out of this in my opinion which is “took me longer to let go” and “find someone who can do equally as good as me”. Firstly everyone says it took them longer to let go. When actually the fact he managed to let go at any time is better than the majority of people in the world who are still struggling to date to do this. Matt is a complete legend in his own right for what he has achieved and if you want to find out more things about Matt here is where you can find him. Vaibhav was the CEO and Founder of Digital Next, a leading UK-based agency. Which he went onto sell for a tidy sum. He now runs a diverse team of digital ninjas across 5 international offices and is a huge online entrepreneur not many talk enough about. So this was almost at the very start of my client servicing business, 2005, I already had a couple of sites making money through affiliate and AdSense and I got my first client, being the lazy person I am I hired a guy, trained him, formed some systems and that guy would work for that client for like a week in the month and rest of the time he would spend on my sites. I was still in college back then but I loved making systems and automation and it’s always been like that. Trust, I follow a rule of thumb, I select based on my gut and give them 100% blind trust on day one, then the actions they take will either increase or decrease that trust. More over I believe in sharing the pie and making it bigger vs keeping it all to myself and trust me the above has really worked well for me. What I find really interesting about Vaibhav was his attitude right from the go to hire someone to complete the work. That’s unusual and he did this while at college. Secondly his view on giving them “100% blind trust on day one”. As many have the attitude they need to earn your trust so this has been why Vaibhav has been able to scale multiple successful businesses and employs over 1000 staff globally. If you want to find out more things about Vaibhav here is where you can find him. Gareth Hoyle is a local lad to my office in Wilmslow in the UK. I was in the startup of my online journey when I first met Gareth and he was one of the first SEO idols of mine for his wealth of knowledge. He had huge offices globally and was always one step ahead of the game with PBNs, automated links and disavow tools. If your agency business grows at a decent rate then it is inevitable that you will have to let go of the control and trust the team around you. I know we have more work to deliver than is possible for 1 person! As you take on bigger, more complex campaigns, you will also likely find that you reach limitations within your own skillset and it makes both financial and business sense to bring in specialists in the areas where you have a weakness. The key for us is to train the trainers well. We have 1-2 people in each team that have worked with us for over 3 years. It is these people that I use to ensure that all other team members are delivering work at the high quality I would expect. We utilise technology to track work output – tools like Harvest are great for tracking both project resource and overall employee output. Project management tools like BaseCamp allow me to keep track of project progress and client comments. The trust factor. Well, that is down to your hiring process. If you are hiring a team leader position, you have to trust these people. If you feel that you can’t, they are the wrong person for the role. What you will find is that once you accept that you cannot control every element of your business without help, and you get the right people in the right roles, you will have more time to either continue the business growth or to actually take some time out and reflect on what you have built so far! And that is one of the greatest rewards you can receive – the freedom to spend your time doing what you want to do rather than what you need to do. Wow, there are two very big points made in this which is “bring in specialists in the areas where you have a weakness” and “freedom to spend your time doing what you want to do”. You cannot be a specialist in all areas of your business. It doesn’t make sense to hire smart people and tell them what to do; we hire smart people so they can tell us what to do. And what delegation gives you is freedom of time which is essential. I did an article on wasted time is worse than wasted money because one thing in life we all cannot buy is time. Gareth Hoyle is an online entrepreneur regularly one step ahead of the curve and if you want to find out more things about Gareth here is where you can find him. One of the best businessmen in scaling multiple companies. Here is what he says regards to delegation? It’s all about finding and hiring people smarter than you. Getting them to join your business. And giving them good work. Then getting out of their way. And trusting them. You have to get out of the way so YOU can focus on the bigger vision. That’s important. And here’s the main thing….you must make them see their work as a MISSION. There is no need to analyse this because it is self-explanatory. If you hire people who are smarter than you, maybe you are showing that you are a little bit smarter than them. I have met Ryan Stewart a few times now at events like LCT live seven figures or busy in Las Vegas and Chiang Mai SEO Conference. His processes and systems within google sheets are nothing short of sensational and utmost respect for the guy. I realized it when I saw the bigger picture – I can’t do everything myself and I need the help of smart people to get to the next level (and beyond). If you have “trust issues” that’s something you need to work out with yourself, that’s not something you want to project onto your staff. I operate under the mindset that my staff is capable until proven otherwise – they don’t need to prove anything to me. Just go out and hire smart people, train them well and give them space to learn, grow and expand your vision without you. The bigger picture here is surrounding yourself around smart people. As Ryan says then you need to learn how to trust your instincts and delegate the work the people who are smart enough to grow your business to the next level. If you ever get out to marketing conferences then Ryan Stewart is certainly someone who would be headlining the events. His wealth of knowledge and success stories speak volumes about the character he is. If you want to find out more things about Ryan here is where you can find him. I completely understand where he gets is forename from because this guy is as mad as they come lol. He is never seen without a bucket of cocktails at the networking events and always the guy with endless enthusiasm. If anyone is interested in real in-house team management skills then this person is the best in the world in management courses. I did a lot of self-study in management early on in my career, where I quickly got a good understanding of the key management skills, however understanding the concept of delegation and doing it, particularly for someone with my personality type is two very different things. It was at least 5 years into my management career before I really started getting a handle on delegation and obviously, as soon as you do, things start going so much faster. I’m naturally very detail oriented and a perfectionist, so not letting go, being in full control of everything is easy enough when you got a small business or a small team, however, if you ever want to grow and scale things, it’s so critical to get this step right. The one major thing that really changed my success with delegation, was when I learned to delegate responsibilities, rather than just the task itself, particularly in the online world, there’s a lot of bad learning with “build the process and hire someone to do it” which often doesn’t include the ownership of the task, meaning that the boss ends up being the spider in the middle, answering all questions, making all major decisions, checking all the work. Making this change is absolutely key and how to do it, is one part of my management course, which helps entrepreneurs grow and scale their business. Now in this above there is a huge knowledge bomb shared with “I learned to delegate responsibilities, rather than just the task itself” because what is really important is your staff or virtual assistants take charge of what they are completing. If they understand the WHY? in what they are doing then they can refine the SOPs and processes along the way. If you ever get the chance to meet Mads or better still get him to train your managers you will be amazed by his vision. If you want to find out more things about Mads here is where you can find him. The truth is even if your staff had the exact blueprint of your systems they couldn’t sell it properly as what sells the business is YOU. Time is the most valuable thing you have and no money can buy this. So if you can relinquish some of your time this is priceless. You need a fine balance in your life and this is where delegation for myself is certainly key to my own personal success. That success in my eyes is more time to spend on creating amazing memories with my family/friends and travelling the world which is why I became a digital nomad and live the laptop lifestyle working whilst travelling. Your value as a leader isn’t knowing how to do everything, it’s knowing who can do what and getting them to do it! Delegating work is one of the hardest things you will ever have to do. Delegating and building your team to help out and have motivation like yourself is hard. But when you master the art of delegation it is one of the most rewarding things you will ever do, period. This is going to kick myself into shape so by January 2020 I am starting to delegate tasks out and can grow my agency. Timely article needed because currently in the grind of working 7 days a week so bookmarking this and going to read each week until I have implemented it. I want proof you have implemented John. Thanks for bookmarking and glad you like the article.